Okay, this may be my hardest feat of the day. I am going to attempt to inform you about this clock without offending a single Catholic. 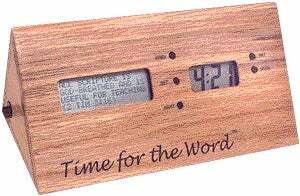 The Time of the Word clock is a simple digital clock that includes a 4-line LCD screen that will display 380 different bible verses. One verse will display for an hour at a time. This clock is encased in a cheesy faux wood. The clock would be great for the lazy Catholics who want to learn popular verses without having to take a lot of time to read that pesky bible ... Damnit. I failed.